Feb 22: We are getting in a HUGE inflatable waterslide! You gotta bring all your friends because they won’t believe how big it is. Also bring your swimmers and a towel. March 3: Is our 24-hour overnight “kids campout”. All the information is on our separate “KidsCampout” form. 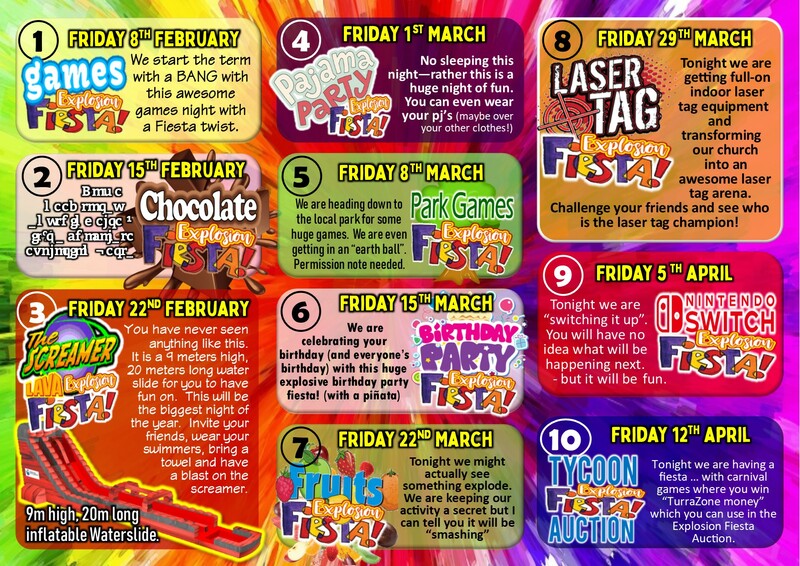 March 8: We are going offsite to the local park for some massive games. You will need a signed permission note. March 29: Laser Tag. We are transforming our church into an awesome indoor laser tag arena with proper laser tag equipment. Bring your friends - will you be the champion? We are so looking forward to seeing you at TurraZone!